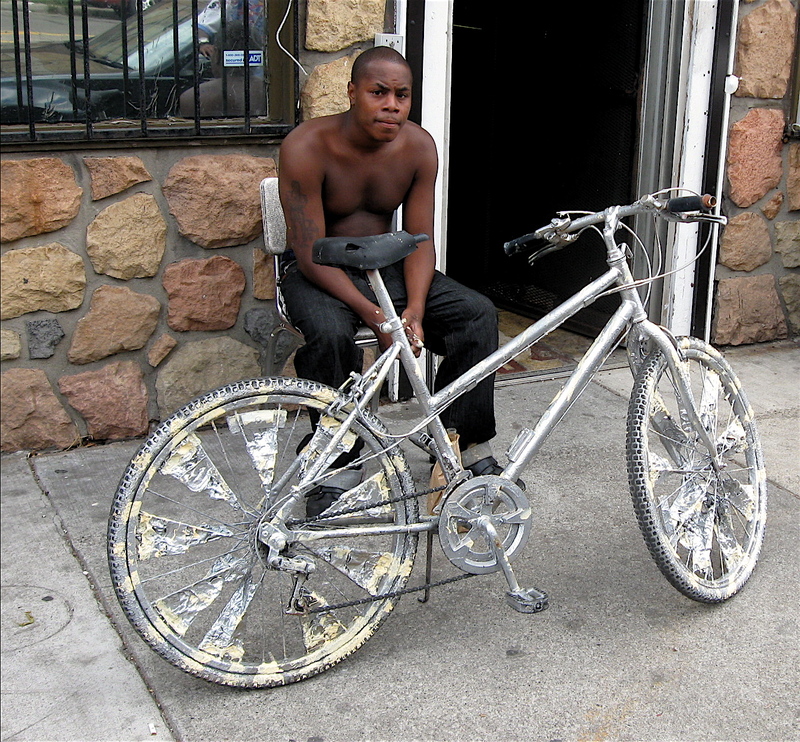 Detroiters like to customize their rides. There are plenty of flashy SUVs on the street and cars with eardrum splitting sound systems that shake the house as they roll by. Southwest Detroit is a hotbed for vintage lowrider cars that can be raised or lowered by the flip of a switch. Hot, tricked-out, import tuner cars can be seen and heard zipping around orange cones on an enclosed racecourse on Belle Isle most Sunday mornings in the summer. 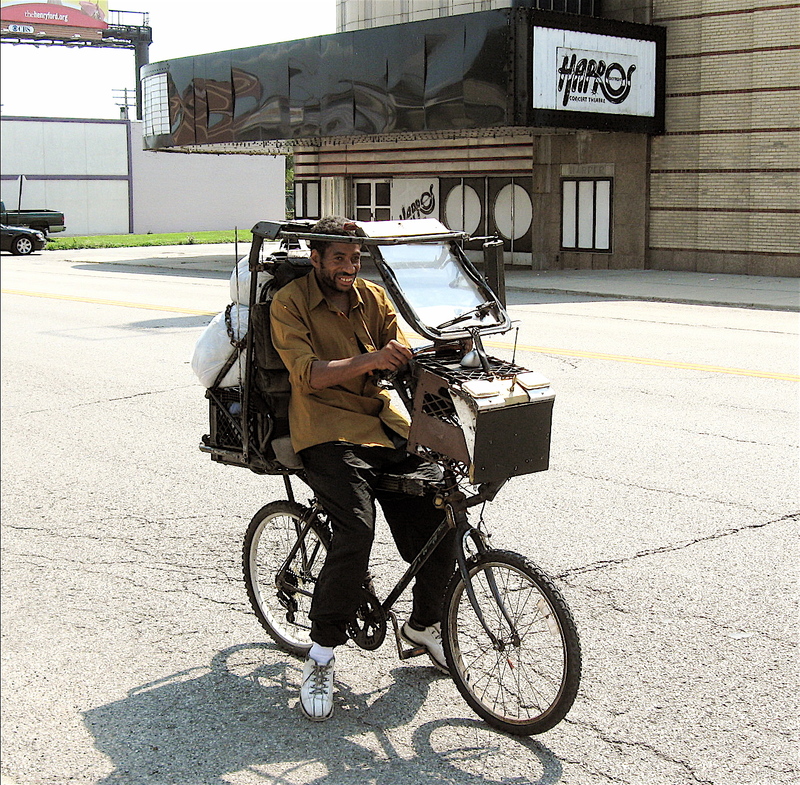 But there’s another group of one-of-a-kind custom vehicles on the streets of Detroit… bicycles! I see lots of bicycles while riding in Detroit, especially throughout the downtown area. 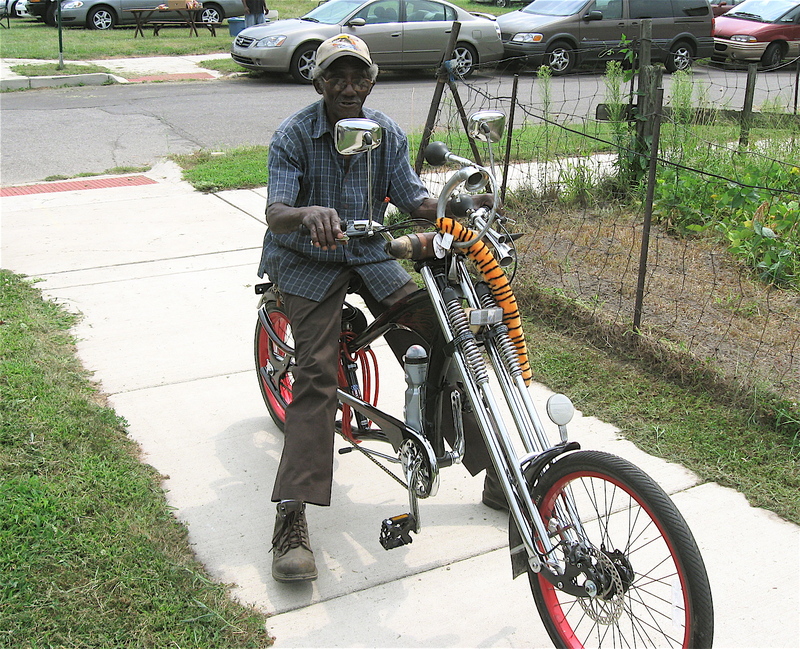 However, the place to spot the coolest bikes in Detroit is in the neighborhoods. The cool bikes I’m talking about aren’t the expensive road bikes built for speed or the brawny mountain bikes that can take a lot of punishment. They’re personalized beauties, customized in ways I’ve never seen. 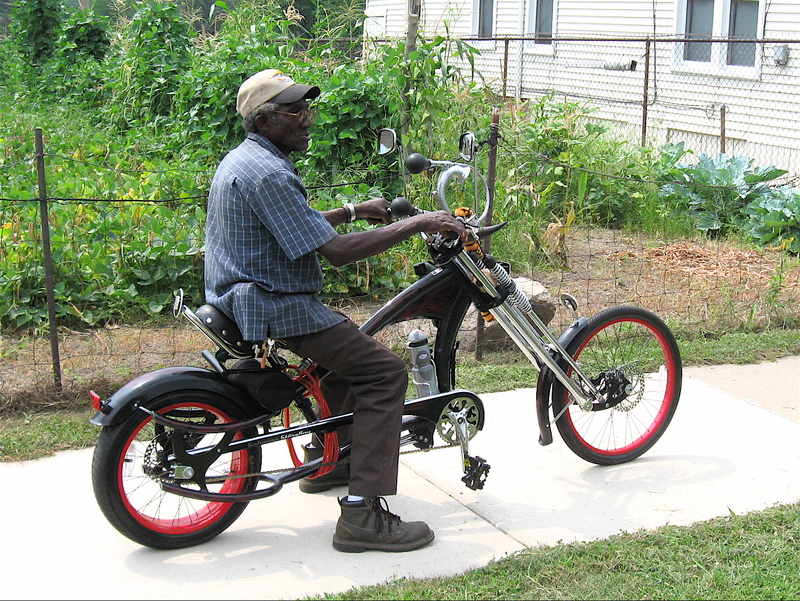 This spotless low-rider is owned by John, a 71-year-old eastside resident who’s been living in his neighborhood for over 50-years. He told me he’s had this bike for a couple of years. “All the stuff you see here, all this stuff, I put on,” he said proudly, pointing out the cow horns, tiger tail, and Cadillac badge on the back and other details. 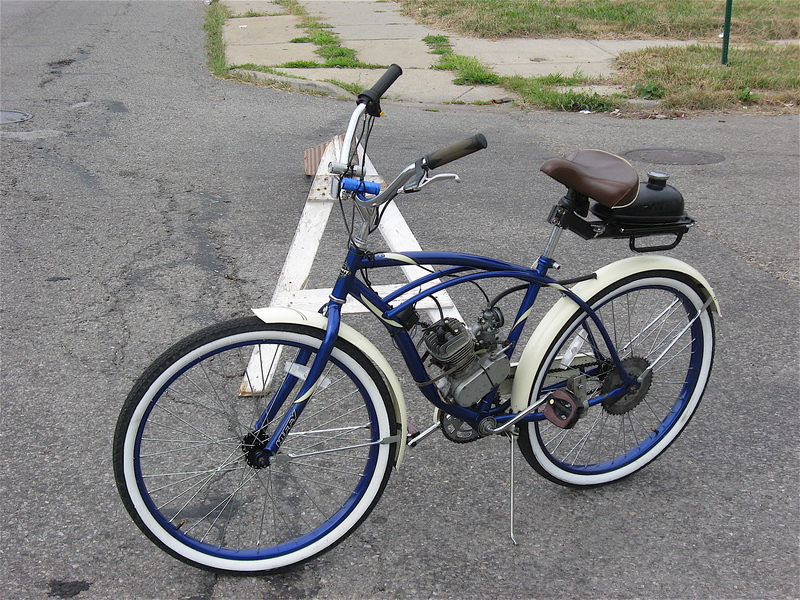 I came across this clean, vintage style bicycle on Mack Avenue. It was in the process of being retrofitted with a small gas engine. The owner told me he was close to finishing it and couldn’t wait to show it to his buddies over at The East Side Riders Bicycle club. Perhaps I’ll see him whizzing down Mack this summer. 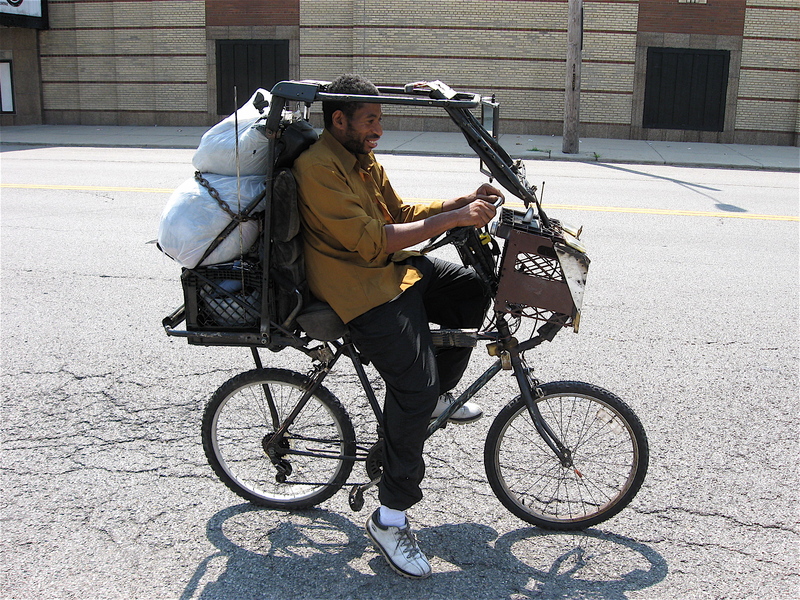 All I can say is this is the coolest bike in Detroit! I came upon this beauty, fitted with a bucket seat, windshield, steering wheel and who knows what else on an early Sunday morning late last summer. The shy man sitting in the bucket seat was a little hesitant about me taking a picture. “It’s not done yet,” he said softly when I asked him if I could take a photo. After a little convincing on my part, he gave me permission. I’d love to see this bike again and check out what changes have been made. Oakland Street, running north from East Grand Boulevard in Detroit, has seen better days. Despite the few remaining liquor stores and other nondescript businesses, commercial abandonment and blight stretches for blocks. 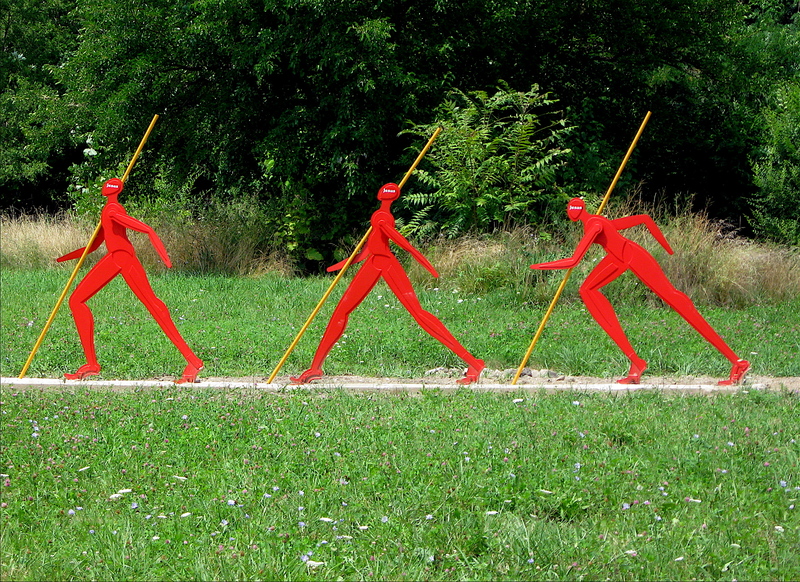 Bicycling south from Caniff Street on this rough and tumble stretch, I came across a nicely designed, bright orange metal sculpture of three, tall, lean walking figures, all carrying poles. Judging by the luster, the newness of the cement base and the clean sand used to support it, the piece appeared to be a recent installation. Each figure had the word Jesus written on the sides of its head. The well-crafted sculpture seemed to be strategically placed on a slight angle, across the field, as if they were walking on a path to freedom or perhaps off to war. 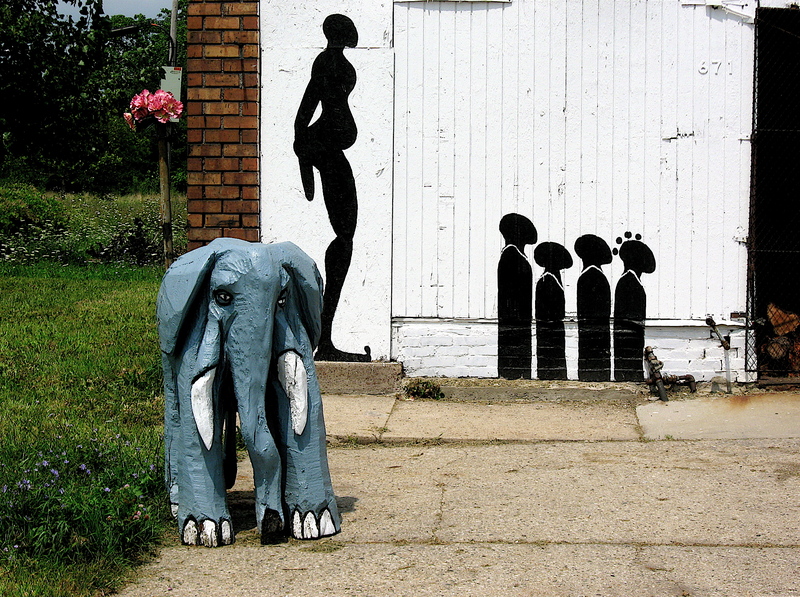 Just beyond the peculiar sculpture, on the same side of Oakland near Bethune Street, stands a modest, well-maintained brick building. The vintage structure features a series of wall paintings similar to the orange sculpture, except they were done in black and white. The works of art had similar lean bodies and long thin legs, reminding me of stilts. A few of the painted figures included details, such as jewelry, making them easily identifiable as paintings of African women. Another image featured a mother figure watching over four children as they stood in line. Standing guard over the place was a small wooden sculpture of an elephant, painted blue. It wasn’t clear to me what this out-of-the-ordinary place was. It could have been a number of things. Maybe an art gallery, design studio or possibly a day care center? I’m not certain. 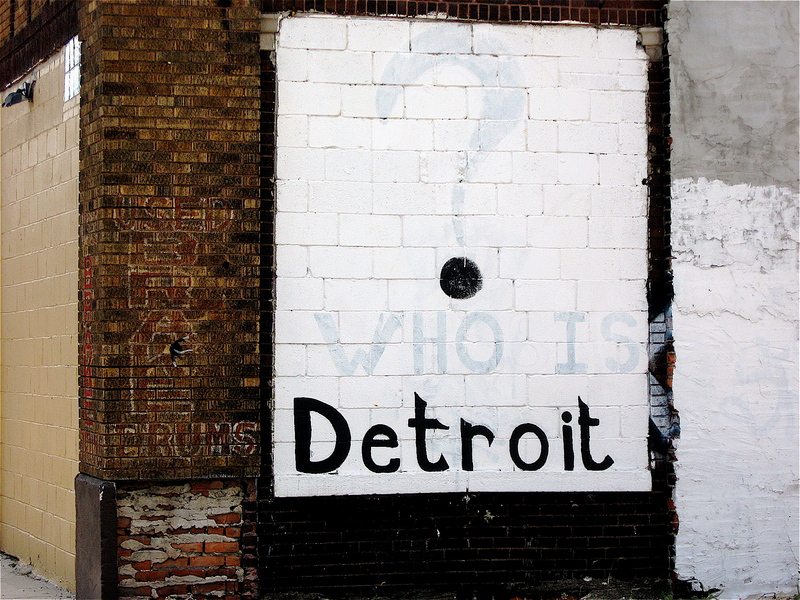 Adding to its mystique was a painting on the north side of the building of a large, faded question mark and the words “who is Detroit”. Was that part of the overall design that included the sculptures and other wall paintings? I couldn’t help but wonder. While bicycling in Detroit I see many interesting people, colorful wall paintings and beautifully restored homes. At times, I’ll stop and stare in awe at the ornate details and craftsmanship found on the exteriors of the stunning early 20th century buildings found downtown and along major streets. On a few occasions, I’ll come across a simple, unassuming building that grabs my attention. It may not be as ornate as the historic Guardian Building, one of the greatest Art Deco buildings in America. Nor does it have to be a sleek Modernist structure made of glass and white travertine like the Yamasaki designed McGregor Memorial Conference Center on the campus of Wayne State University. Sometimes a simple building in Detroit is just plain interesting. 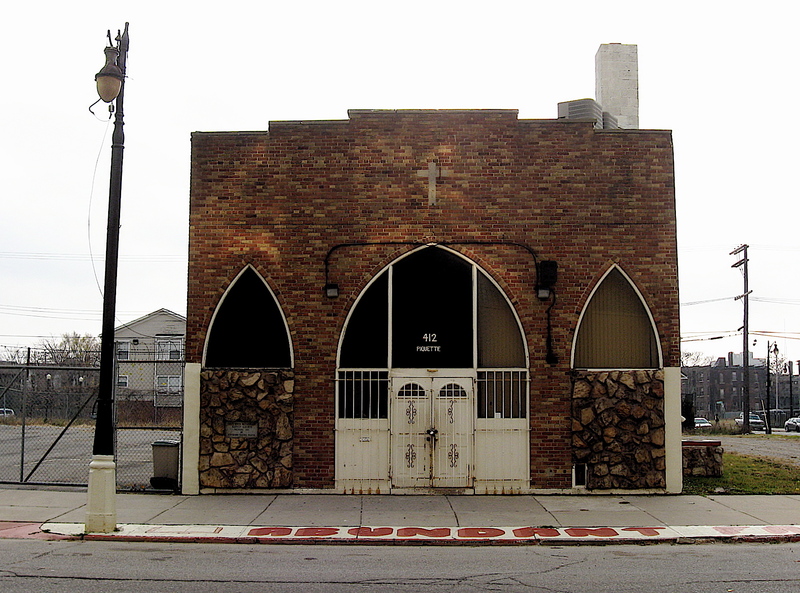 One such building is a small, unpretentious church I saw on Piquette Street in the historic Milwaukee Junction area of the city. What initially caught my eye were the arched windows. They reminded me of a Bishop’s hat or miter, especially the two sitting on top of the stonework flanking the outer edges of the building, much like bookends. Looking closely at the wide, arched window sections above the entrance and the framework of the doorway that stretches to the sidewalk, a face started to emerge. Not just any face, but one that may be found in the design of an African mask. The half-moon windows in the doors appeared to be eyes. The heavy, chrome padlock used to secure the steel grate looked like a nose and the flat straight line spanning the bottom of the two doors, the mouth. The two steel barred windows and white panels frame the face and the whole thing seemed to be anchored to the sidewalk by five little brown claws (made by rusty water dripping from the steel bars above) on both sides of the doors. 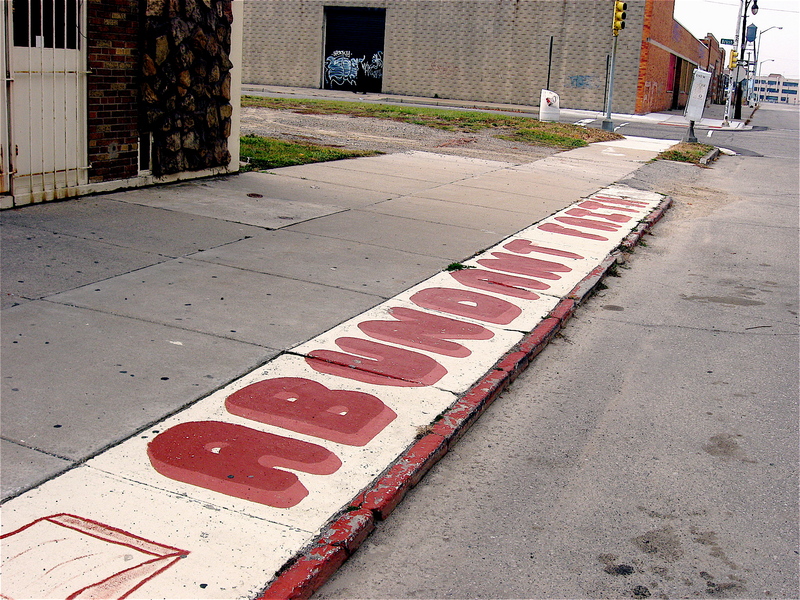 The church name, along with an outline of a bible was painted in red on the sidewalk in front of the place. It was the only name of the church I saw. Judging by the vintage bishop globe streetlight and the industrial look of the building, I would guess the building was once a small manufacturing facility built in the 1930’s. 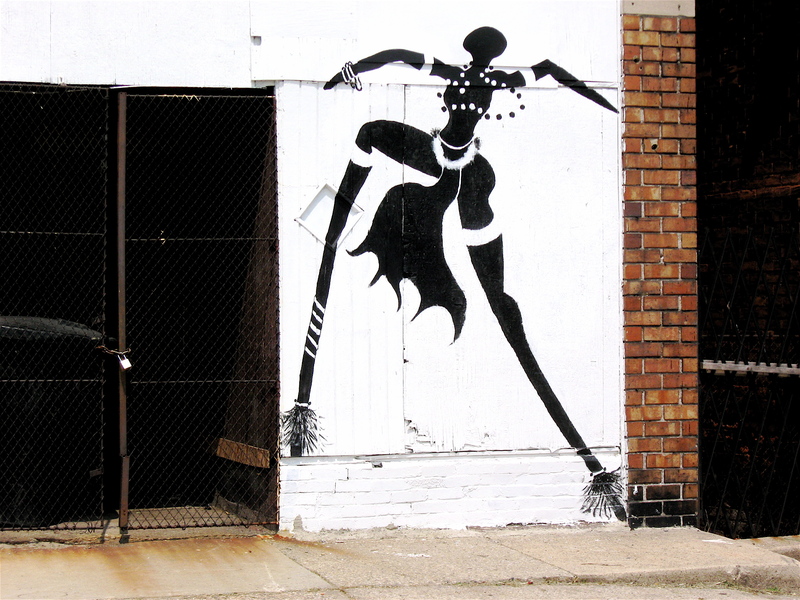 Over the past few weeks I wrote a series of entries on Detroit’s significant amount of colorful, eye-catching graffiti. In part one I gave an overview of where graffiti could be found and the environment in which it had been created. In part two, I highlighted unique, colorful caricatures and images I’ve come across while bicycling in Detroit. 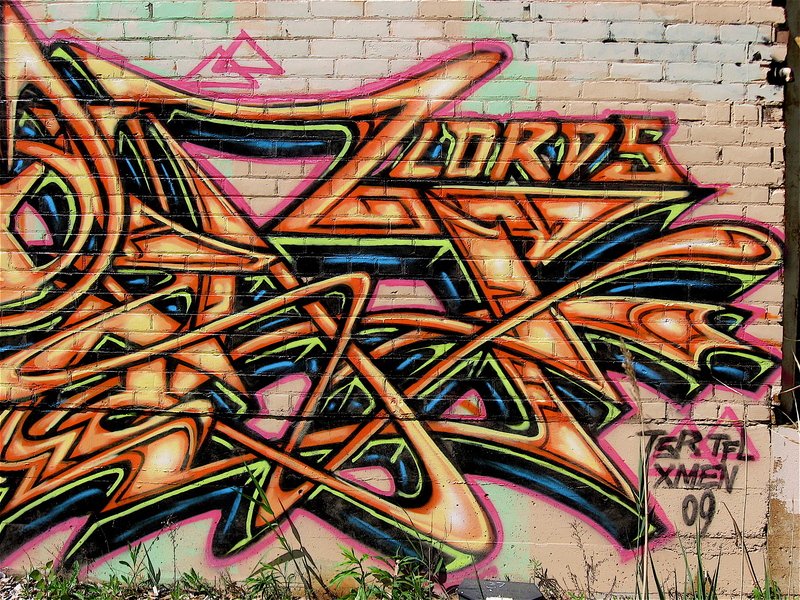 Highly stylized graffiti names using various letter styles was the theme for part three in the series. Part four was dedicated to street and political messages and the methods used to spread them across the city. Those mediums include stickers, simple one-color spray painted tags or detailed multi-color writings, all of which I’ve spotted while riding throughout Detroit. 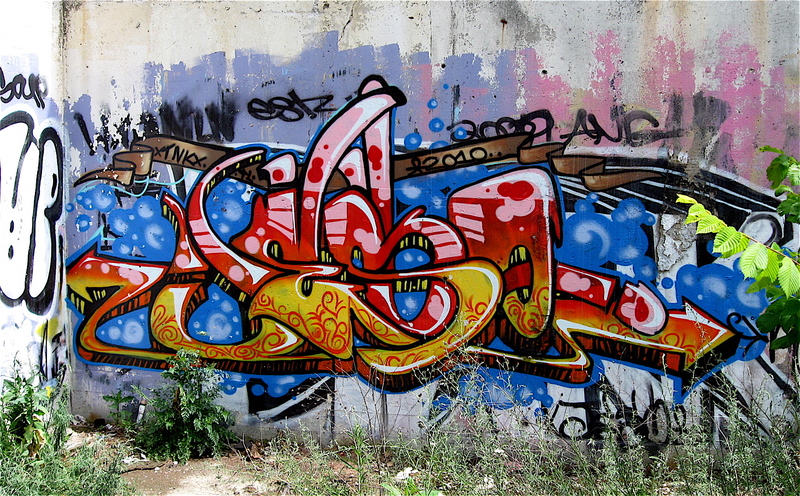 This entry, the fifth and final of the series, is dedicated to the masterpiece; a large, multi-colored piece of wall art that many of us may think of when the word graffiti is spoken. 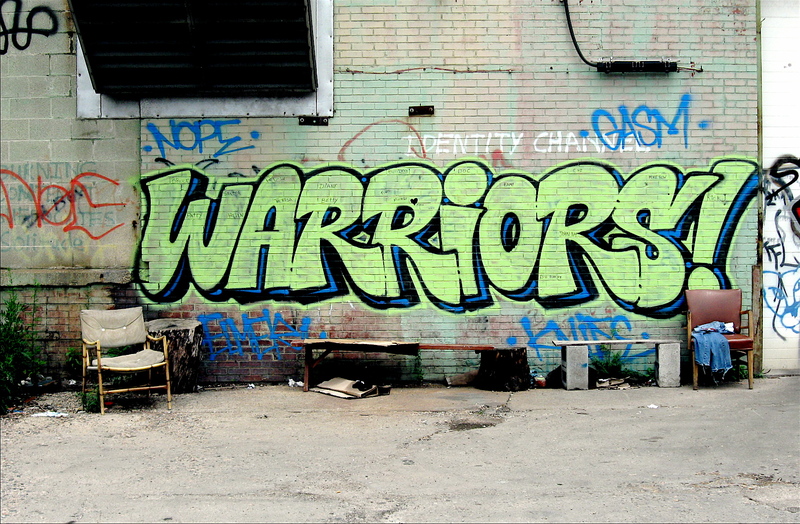 In the graffiti world, the masterpiece is a complex writing (painting) comprised of three or more colors that features intricate design elements such as flowing interlocking letters, arrows and other distinct decorative elements. 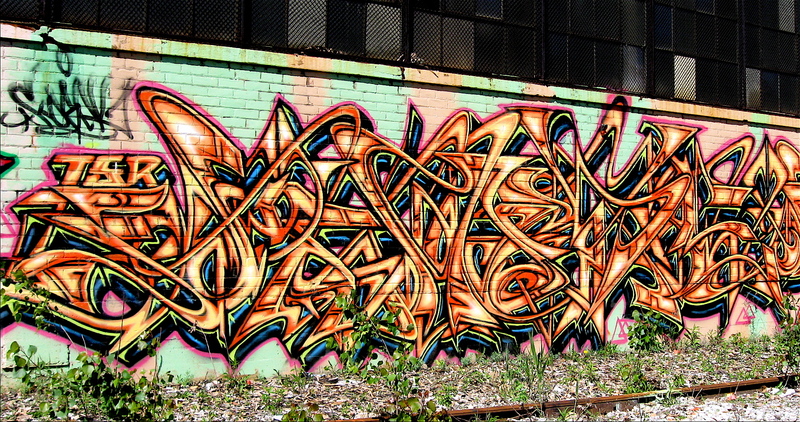 Because of their wild style, these elegant, three-dimensional looking, multi-colored pieces are often difficult to read by non-graffiti artists. In many cases, the writer’s initials or other messages are often buried deep within the razor-sharp edges and crisp outlines of the design. Because of their size, range of colors and complicated design, creating a masterpiece can be labor-intensive and consume a considerable amount of time to produce. 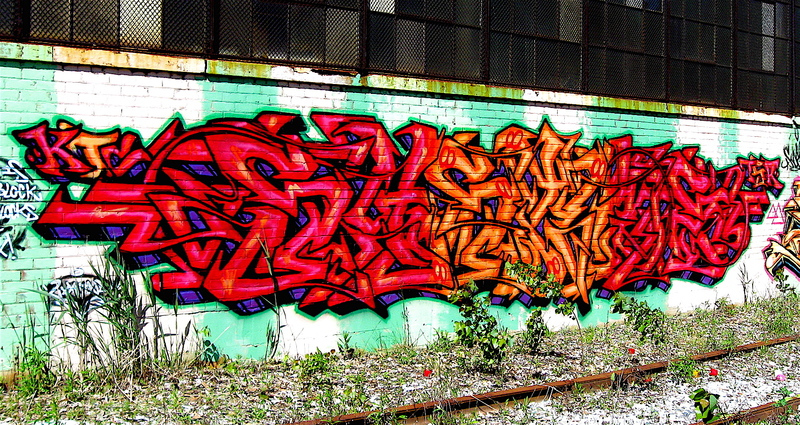 As I soon discovered while bicycling in Detroit, there are many graffiti galleries (areas of high concentration) found along railroad tracks, on the sides and interiors of abandoned factories and within the Dequindre Cut that showcase the spectacular masterpieces. Although they’re out there, I’ve rarely seen them in hard-to-reach places such as flat surfaces near the rooftops of tall buildings because of the writer’s risk of being caught and the time needed to write such a large, intricate piece of graffiti art. Plus, it can be dangerous for a writer if the structure is unsound and deteriorated. The masterpiece is hard to do illegally because of the time and effort it takes. Therefore, a well-done piece on a side of a warehouse will garner a lot of admiration from fellow writers for its creator. 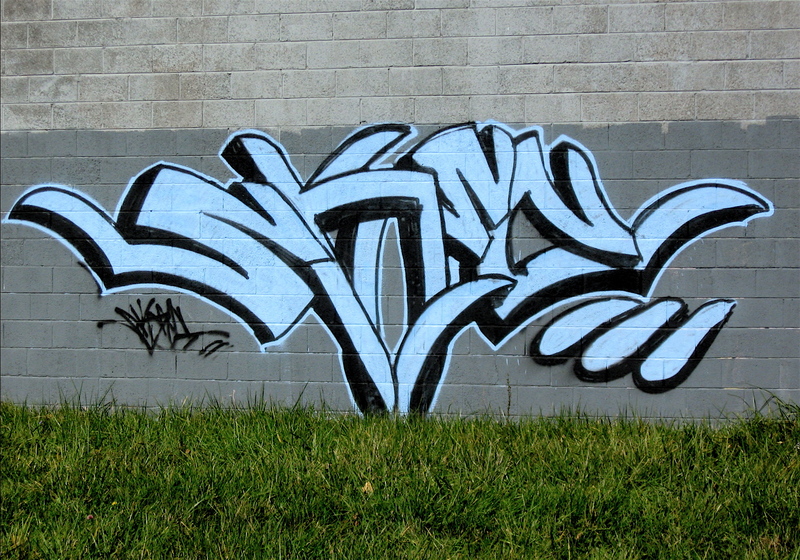 As graffiti has gained respect as a valid art form, masterpieces are now being commissioned. 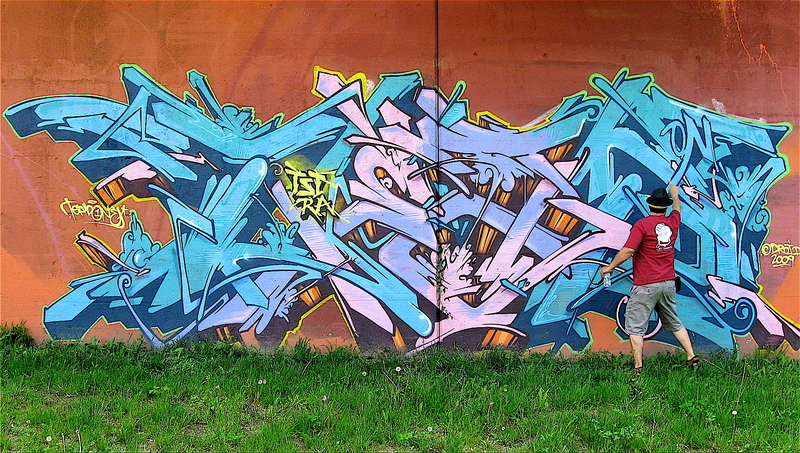 A good example of commissioned masterpieces can be found within the Dequindre Cut on Detroit’s east side. The greenway path (formerly an abandoned Grand Trunk Railroad line) is part of the Detroit Riverfront Conservancy, and they have commissioned graffiti artists to create some of the mystifying pieces found in that below-street level path. 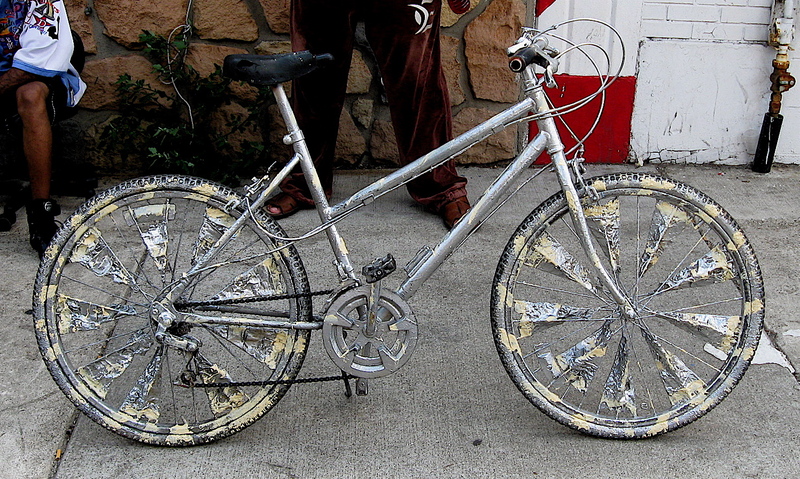 While looking at these and other pieces, I’m always amazed at what a writer can do with cans of spray paint. This five-part series showcased a mere sampling of the many, many pieces of graffiti art I’ve found and photographed on my two-wheel travels across this great city. The graffiti art form has existed since ancient times and it’s obvious to me that it still remains a strong way for people to express themselves. 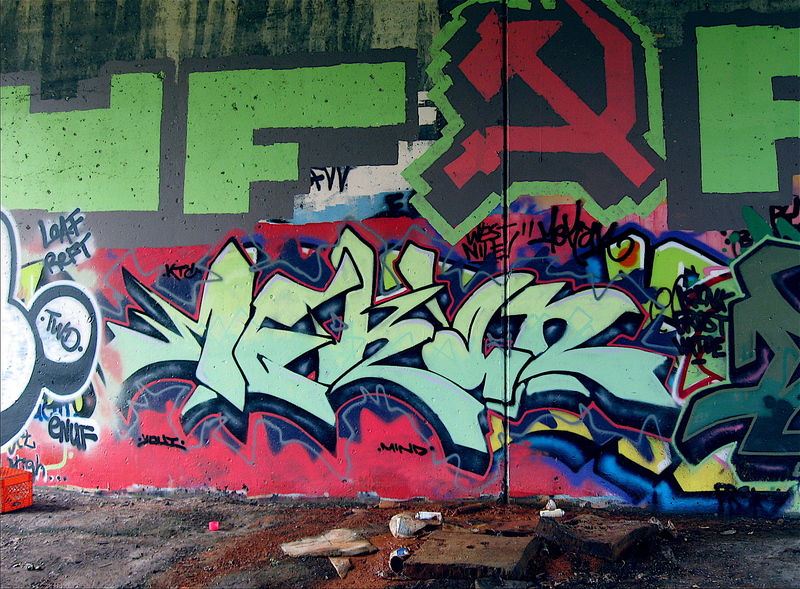 Law enforcement officials and others would argue that graffiti is nothing more than vandalism. Graffiti writers would argue that graffiti is an art form, and many of them would say it’s no different from the thousands of commercial messages, logos, etc. we are exposed to on a daily basis. So is graffiti art or vandalism? I’d love your comments on this. 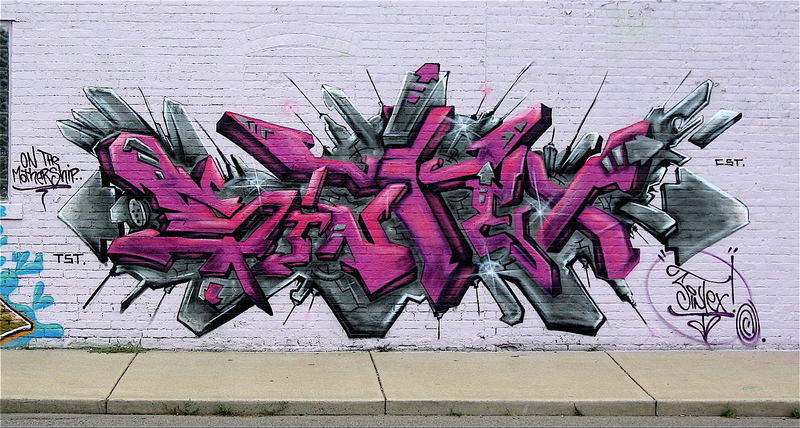 This entry on Graffiti Art in Detroit is 1 of 5 in a series. To view the others in this series, simply click on the one of the headlines below.